Want to liven up your foyer music? Looking for something just a bit different to play during your interval? This audio CD holds a total of 17 daft ‘radio’ adverts for a wide range of fictional fairytale / pantomime products and services, and 7 silly announcements to your audience (plus a bonus track promoting next season’s fairyland TV schedule). Supplied in CD case with cover. Fairy Godfather Services – Evil plans thwarted again? Even the odds! Heroes R Us – Kingdoms saved, villains vanquished! Grimm Brothers Finance and Loans – The perfect way to manage your debt worries. Three Pigs Construction services – Saving your bacon! Germinator 4 – The rise of the beans! Bonus Track! Pig Brother House / Dame Academy TV Advert – What’s on next season! Exit – Please leave before the cast catch and disembowel the little scamp in the 3rd row! Also available are two sequel CDs: Four and Twenty more adverts and Four and Twenty – the 3rd album. 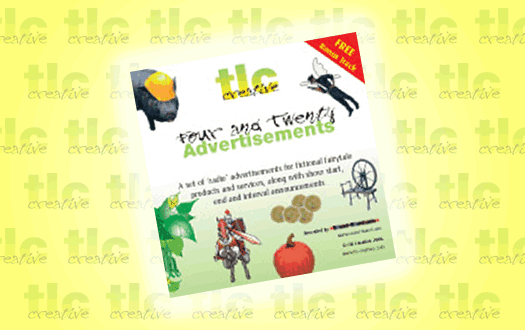 We also have printable spoof fairy-tale adverts to use in your show programmes: Spoof Adverts.